The trend strength indicator set is a collection of indicators designed to help TradeStation users identify trending markets in any time frame, and to take advantage of these markets. The trend strength indicator analyzes prices over time to determine which of the three trending stages the market is in - bullish, bearish or neutral. In addition to identifying which trend stage the market is in the trend strength formula goes one step further when analyzing the trend in that it scores the current trend on a scale of 0-10 with 0 representing a strong bearish trend and 10 representing a strong bullish trend. Utilizing the trend strength formula we have also included two additional indicators to help take advantage of this trend strength scoring method. The first is a trend reversal indicator which identifies when a major trend shift has occurred and the market has shifted from a bullish to a bearish trend, or vice versa. This provides an opportunity to identify trend changing markets and take advantage of the change in trend early. And to help traders make the most of the trend we have included a new trailing stop indicator that works with the trend reversal indicator to trail a stop in measured stages as it follows the market. For traders that prefer a more traditional stop that follows price more closely we are also including our trailing stop indicators for free. The second of our trend strength associated indicators is a pullback indicator designed to help swing traders identify strongly trending markets and alerting them when these markets pullback providing potential swing trading opportunities. 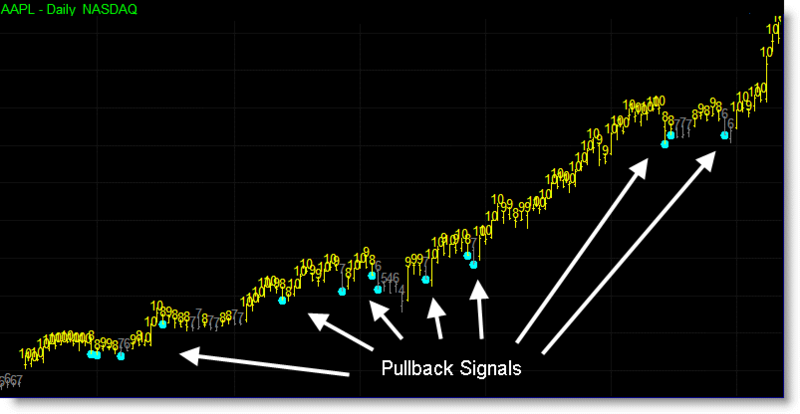 Swing traders can select exactly how large or small the pullback should be and how long the pullback should take. The trend strength indicator set also includes a FREE copy of our trailing stop indicators which we feel compliment our trend strength indicators. An intraday chart of the forex markets with the trend strength indicator displaying both colored bars and the actual trend strength value on each bar. The trend strength indicator includes the option to color code each bar or candlestick on the chart to make it quick and easy to identify the trend as well as the option to display the actual trend strength value on each bar, also color coded. If you prefer to keep your price charts clean then the trend strength indicator is also provided as a regular indicator that can be plotted in a sub-graph as demonstrated in the chart below which includes both the color bar/text indicator and the regular indicator for comparison. 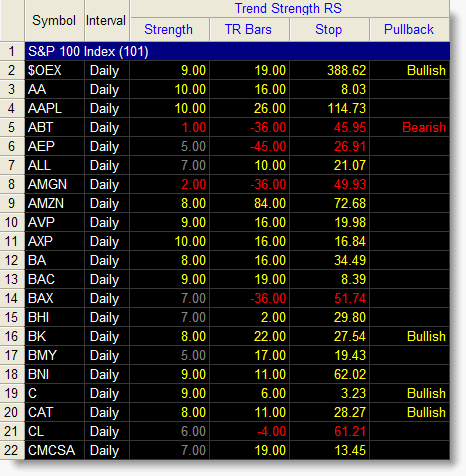 Click to view all trend strength indicator screenshots. The trend strength indicators include multiple settings allowing you to personalize the indicators including changing the prices used to calculate trend strength and the associated trailing stops, the sensitivity of the indicator or the values necessary to trigger a bullish, bearish or neutral trend. Swing traders can select exactly how large or small the pullback should be and how long the pullback should take. The trend reversal indicator is a TradeStation showme indicator that alerts you when the trend changes from bullish to bearish, or vice versa. When a trend is neutral the indicator treats this as a consolidation of the prior trend and waits for the trend to continue or to reverse, triggering an alert. This indicator also includes an optional trailing stop that compliments the trend strength indicator by matching the current trend and trailing a stop in measured increments. The chart below includes both the trend strength bars indicator and the trend reversal showme indicator in the same chart. The large showme dots indicate when the indicator alerted to a change in trend and the small showme dots represent the trailing stop. The trend pullback indicator is used to identify pullbacks that occur during a strong trending market, particularly useful for swing traders. Users can set the minimum bullish or bearish trend necessary along with the minimum and maximum requirements of each pullback and the number of bars during which the pullback should occur. 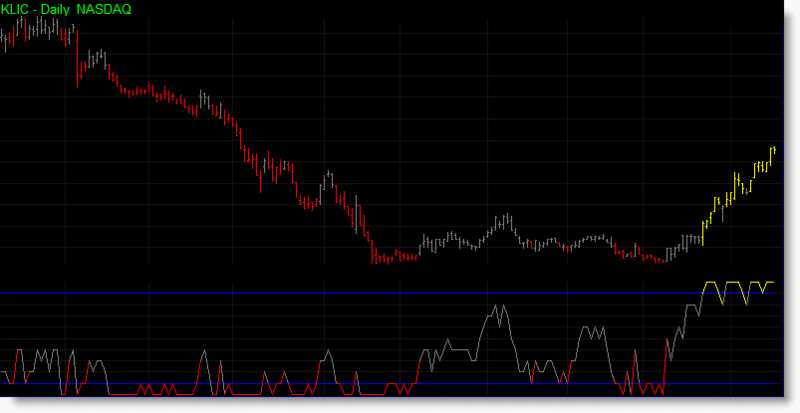 The indicator will then alert you as each pullback occurs. The chart below includes both the trend strength bars indicator and the trend pullback showme indicator in the same chart. The showme dots on each chart show when a trend pullback signal triggered. When applied to a RadarScreen the trend strength indicator provides extra information in addition to the current trend strength value. Strength - displays the current trend strength value. 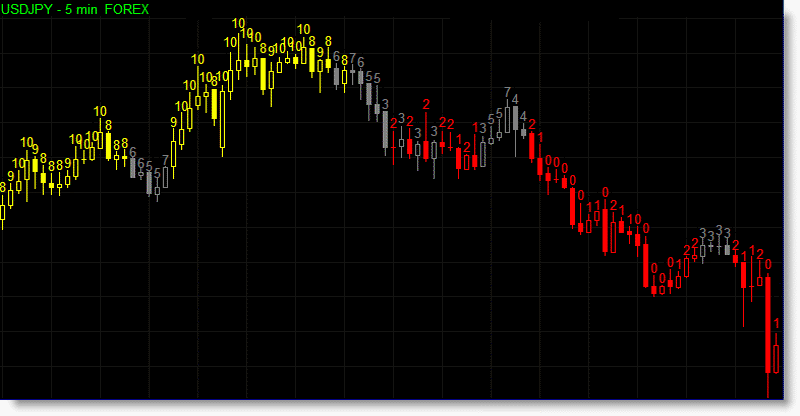 Bar Count – tells how many bars the current bullish or bearish trend, measured by the trend reversal indicator, has been active. A positive number indicates a bullish trend, while a negative number indicates a bearish trend. Stop - is the current trailing stop price. Pullback - displays an alert if a trend pullback exists on the current bar. 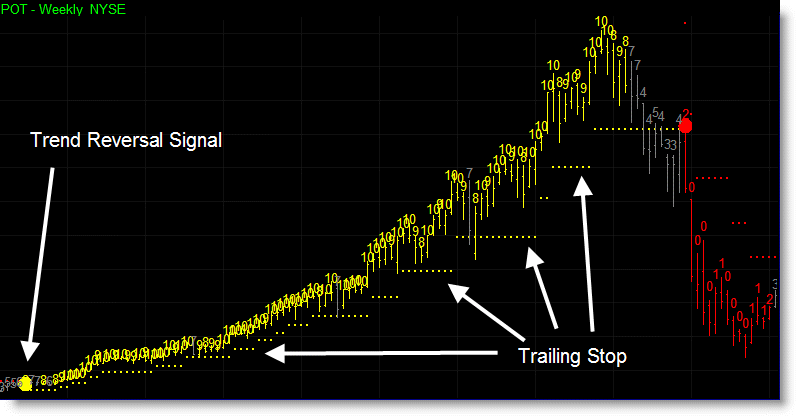 The trend strength indicator applied to a RadarScreen containing the S&P 500 stocks. Click the button below to add the Trend Strength Indicator Set for TradeStation to your wish list.